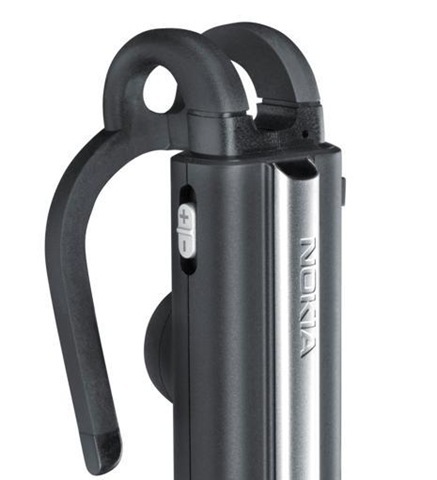 When we covered the Nokia BH-804 , we proclaimed it “Nokia’s most complete Bluetooth headset to date,” and still consider it one of the best headsets out there. Such a status isn’t easily achieved, of course. Most of it can be attributed to the high-quality materials, design-centric styling and considering it’s diminutive size, good wireless performance and battery life. Audio performance was also rated it as “above average.” An impressive feat for such a small piece of gadgetry. 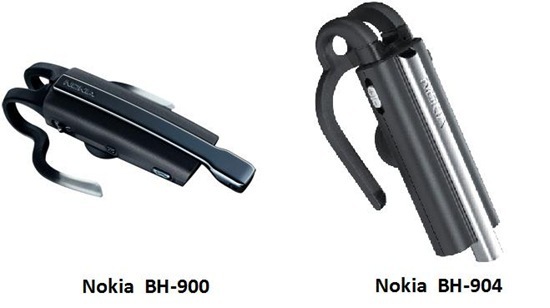 One would think that these elements are the only key for the success of such a Bluetooth headset, but as the Nokia BH-904 proves, there are different ways to reach one goal. In fact, the story of the BH-904 is one that contradicts with what is considered the current norm and completely defies current trends. This especially becomes evident when it’s compared to it’s smaller sibling, the BH-804, a Bluetooth headset that prioritizes style. As this review will show, some of these contradictions are actually in the BH-904’s favor. The 904’s packaging is basic and functional, communicating it’s capabilities, without being too plain. The 804 goes the complete opposite route, where it’s is all about presentation with its “hidden treasure”theme, key, lock, map and treasure box. Packaging is usually not a deal breaker, if you ask us, but in the case of the of the 804 it does stand out. I can see myself giving someone the BH-804 with its fancy box without ever using gift wrapping, while with the 904 it’s simply not the same. The 904’s package consists of two parts: an inner and an outer box. Staying true to the “Noise” theme,the outer box is decorated with Blue lines that symbolize heavy amounts of noise, while cut-out letters characterize missed or misunderstood words during a conversation in a noisy environment. When you pull out the inner box the same theme is continued, but this time the cut out letters are gone and replaced by complete words, while the Blue lines are less defined, representing noise being suppressed. Not very obvious at first, but a nice detail that serves the purpose of communicating the unit’s capabilities, instead of just using random box art. A nice little detail. Despite the fairly large box, there isn’t much to be found inside. Other than the BH-904 itself you’ll find the charger and 3 different shaped changeable ear piece rubbers. That’s it. While this does covers the basics, one look at that the impressive list of accessories included with the 804, we couldn’t help but feel like Nokia forgot a few extras. Accessories such as a desk stand, pouch or even neckstrap would have been extremely welcome. Nokia has been doing an impressive job when it comes to green packaging, with recycled materials and smaller packages, but in this case of the BH-904 there doesn’t seem any sign of recycled materials being used. What’s even stranger is that the 804 uses a smaller package with a lot more content. At first sight, it’s the large dimensions of the BH-904 that catches your attention. When it comes to Bluetooth headsets the general trend is towards small, trendy headsets, much like the BH-804 itself. The 904 totally ignores this trend and in what can only be described as something that tech support might use to answer calls. If the large size wasn’t enough, sliding the boom down makes for an even larger looking unit, adding an extra one third of its length. Despite its size, Nokia has managed to make it look good and give it a “pro” looking design, that although not as pretty as the 804, definitely looks good. This is not an easy task if you ask us. The use of mostly Black colors, also helps to make the unit look much smaller than it really is, while the metal Boom draws your attention to the center, giving it the impression of it being a lot slimmer. Let’s take a spin around the BH-904. One of the distinguishing features of the 904 is the U-shaped ear hook. Smaller headsets rely mostly on the earpiece itself or an optional ear loop to keep it in place. This model keeps true to a tradition started by the BH-900 by using a built-in non-removable U-shaped ear hook. The benefits here are clear: no need to worry about loosing the ear loop or forgetting it at home, it’s always there. It’s also very flexible and scores high on the comfort level, while still being a able to hold such a large headset securely in place. The comfortable fit comes from the U-shaped design of the hook. It seems to spread the weight of the headset around the ear and slightly raises the headset above it, giving the impression that the BH-904 was almost floating above your ear. In fact, during prolonged usage, the 904s never seem to put any strain on the ear, barely even touching it. In some cases I even forgot I had it on. It’s safe to say that the BH-904 can be worn the entire day without a single problem. This becomes even more impressive when you consider that 904s has the same length as two 804s, or three with the Boom extended and weighs more than two 804s put together. One thing worth noting however is that the U-hook isn’t adjustable, but relies solely on the flexibility of the rubbery material used. This never compromises comfort, but due to varying ear sizes and shapes, it doesn’t always allow for the earpiece to fit exactly on top of the ear canal. This is precisely what happened in my case. The fact that the earpiece didn’t sit right above the ear canal, strangely didn’t have any effect on the volume or audio quality, clearly showcasing the quality of the earpiece itself. Despite the great audio performance, I would like to see future versions of the headset with an adjustable hook or even better: an adjustable earpiece that can slide up or down and locking into various positions, in turn accommodating varying ear shapes. The BH-904 certainly has the size to house such a feature. The most striking design element of the BH-904 is the metal sliding boom. At first this features seems to add unnecessary length and bulk without truly serving a purpose, but during our usage it actually worked incredibly well, easily proving its usefulness. The idea behind it is simple: the closer a boom mic is to your mouth, the better its chances of faithfully capturing audio.Only problem is that the distance between the ear and mouth is relatively long, requiring an equally long headset. 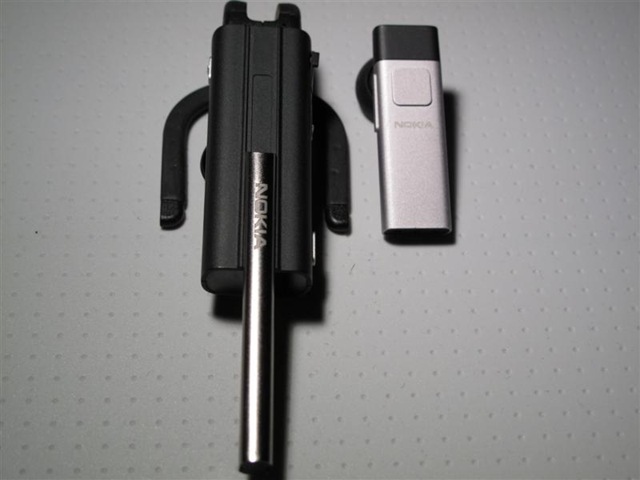 Nokia solved this problem with the slide mechanism, allowing you to bring the boom closer to your mouth when talking . The sliding boom is not only used to bring the mic closer to your mouth, but also to increase the distance between lower mic and the one on top near the hook. The BH-904 than utilizes a Digital Signal processor (DSP) to separate speech from background noise. If that wasn’t enough, the sliding boom can even be used to answer or end calls, by gently pushing it down towards your mouth or up to its initial position. While there’s also an Answer/End key, I prefer the sliding boom as it is more intuitive to use. It has a smooth sliding movement, that slightly accelerates the slide speed at about half way through. The slide is not spring-assisted, but we would love to see them add this feature. The left side is almost clear, except for the single volume key. You have to slide it repeatedly up or down to increase or decrease the volume. The key has a strong spring-assist mechanism that requires a little more force than usual, but otherwise works great. On the right there’s an Answer/End key in the case that answering calls with the sliding Boom isn’t quite your thing. It basically mimics the functionality of the sliding boom, but we’re always fans of having options. On top of that it also adds voice dialing capabilities and last call, something that can’t be done with the sliding boom. There’s also a mute button and last but not least a microUSB port. 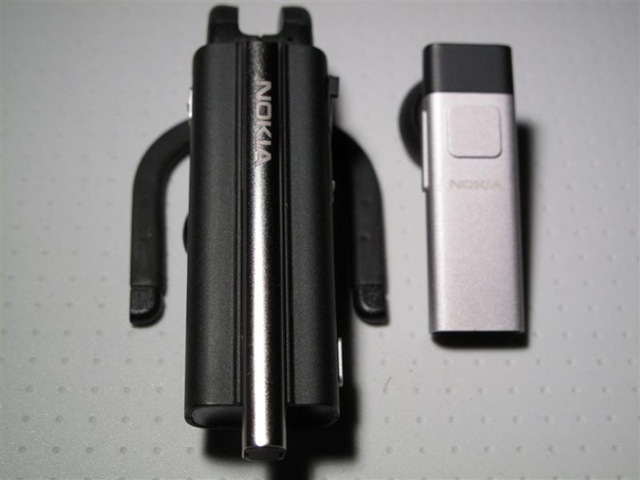 We’re happy that Nokia went the microUSB route instead of some proprietary connection or even the usual Nokia 2.0mm or 3.5mm charger connector. This means that I’m for example able to use the Nokia N900’s charger or even third party chargers such as the Powermat’s Powercube. While the 804 does use microUSB charger with its desk stand or Charger Adapter AD-68, these are accessories that I wouldn’t necessarily have with me all the time, but that I do need to be able to charge. 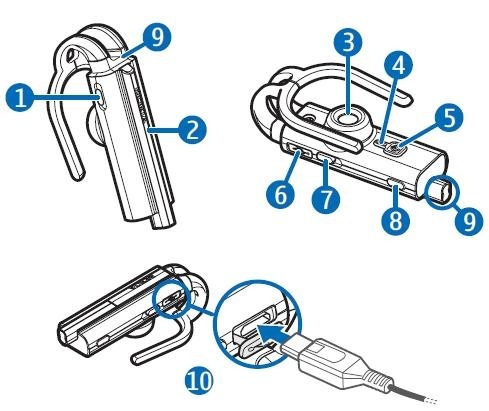 In the case of the BH-904 I can just grab any Nokia microUSB charger and connect it directly to the headset without the use of any adapters or accessories that I can potentially loose. This is a major advantage over the BH-804. On the back we can find the earpiece, power key and indicator Light. Worth noting here is even though there are various interchangeable earplugs offered, they really don’t vary that much in size due to the large size of the earpiece itself. This isn’t much of an issue though as the earpieces never enter the ear canal but sits right above it, basically making the interchangeable earplug useless. 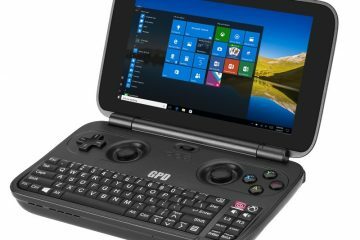 One interesting feature of that’s not found on the BH-804 is the 904s ability to connect to two devices at same time such as your N900 for phone calls and your Bluetooth enabled laptop for Skype calls. Another feature missing from the BH-804. When it comes to day to day operation, the BH-904 is very similar to other Bluetooth headsets, including the BH-804. When you turn it on, it briefly uses the Indicator Light to show the battery charge level by using one of three colors: Green means that the charge level is sufficient, Yellow indicates that there’s some juice left, but you may need to recharge it soon, while Red means that the battery is pretty much empty. Even though it’s supposed to show three colors, so far I’ve only seen Green and Red. When the headset is On, briefly pressing the Power button will also give you the battery status functionality. This is a handy feature that’s actually useable on the 904 in the sense that while most headsets can show the battery status, most of them require long charging times, making it unusable for quick charge-and-go scenarios. A quick charge of just 15 minutes with the 904 gave us a remarkable 5+ hours of operating time, slightly more than the advertised number. To put this into perspective, that’s one hour more than the BH-804’s maximum operating time and that’s from just 15 minutes of charging! Pretty amazing stuff. A full charge requires an equally speedy 35 minutes. I was able to fully charge our sample in about 25-30 minutes, which should have given us a jaw dropping 8 hours of talk time. During our testing which involved listening to Podcasts, Music and making a few calls, we actually managed to get just bit over 9 hours! Other headsets that offer a talk time in the 8 hour range, such as the Jabra Stone, still need a slow 2 hours to completely charge the unit, a definite win for the 904. While it isn’t as stylish as other small headsets like the Nokia BH-804 or Jawbone Icon, its large size easily makes room for a large battery, with an impressive talk time to match. The first time the BH-904 is powered on, it automatically goes into pairing mode and requires the usual 0000 pass key. When connected to one or two devices, the indicator light slowly flashes a Blue light, indicating an ongoing connection. We tested the BH-904 with the Nokia N900 and noticed that there was a noticeable increase in volume when we upgraded to the latest firmware. The headset worked great with the N900, supporting every single feature like voice dialing, redialing last number and even answering calls with the sliding boom. There does seem to be a bug on the N900, which affects the BH-904. In some cases, when left connected to the N900 without being used, it would suddenly send out a piercing White noise that can only stopped by turning the BH-904 Off. It didn’t happen that often for it to be an issue, but we’re pretty confident it’s not an issue with the BH-904 itself, but a bug that needs to be addressed on the N900 through future firmware upgrades. We really liked the multi-point connection feature, which is limited to 2 devices, which should be enough for most people. Although we do wish that future versions could add support for 3 devices: two phones and a possible third connection for VOIP via Skype. By default this feature is disabled but can be activated by turning off the headset and than holding the power button and volume up key. This does require you to turn off the headset, again bringing it into pairing mode to add the second device and than powering it off and on to establish connection to both devices at the same time.Getting the headset to connect to two devices wasn’t difficult, but it wasn’t as intuitive as it should be. The manual doesn’t help either, providing little detail about the process. For example it does tell you how to enable the multi-point connection but doesn’t say anything about bringing the headset into pairing mode for the second device. Current headset users shouldn’t have many problems getting this feature to work, but new users will likely be scratching their heads. Once up and running, future connections are luckily established automatically. Nokia should make the process a bit easier or at least explain this better. 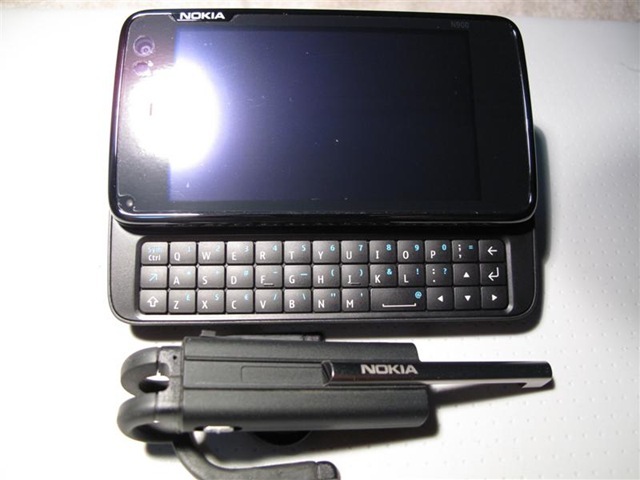 The feature worked seamlessly being able to connect to both the Nokia N900 and my Bluetooth enabled laptop and handling calls from both devices without any problems while being connected to both devices at the same time. During our testing it didn’t seem to affect battery life or wireless range. One interesting detail, similar to what we’ve seen on the BH-804, is that when there’s an incoming call via Skype, the BH-904 will generate its own Nokia Tune tone until it’s cut off by the Skype incoming call tone. When audio performance and wireless range is concerned, the 904 will easily beat the 804 delivering a range that’s almost twice or in some cases three times longer while also being able to produce louder and clearer voice calls. While both have the ability to suppress noise, the 904 seems to have a significant edge which I can attribute to the two mics that are separated by a greater distance than on the BH-804. 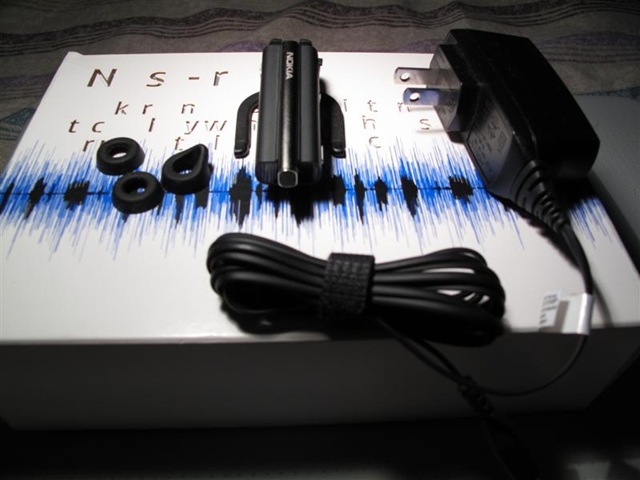 This seems to help the DSP to better distinguish noise from your voice. The sliding Boom seem to help here a lot too, bringing one of the mics closer to your mouth. According to Nokia, the noise cancelation only works when the boom is pulled down. This is supported by the fact that a caller wasn’t able her me when driving at high speeds with all windows down, but when I pulled down the boom I could have a normal conversation, something that simply wasn’t possible on the BH-804 or any other Bluetooth headset I’ve tried before. The BH-904 contradicts with what is considered the current norm and completely defies current trends. This especially becomes evident in a world where much smaller units such as the Jawbone Icon and Nokia BH-804 that prioritizes style and ultra small size reign supreme. The Nokia BH-904 clearly proves, there are different ways to reach one goal. In this case it is the contradicting large size that helps it push way ahead of the pack. By having a large unit, there’s not only more space to house a larger battery, but it also seems to help the wireless range. The 904’s packaging is basic and functional, communicating it’s capabilities, but lacks the style and presentation of the BH-804. Despite Nokia’s recent Green efforts, they seem to have forgotten about the 904, using a package that seems unnecessarily large. 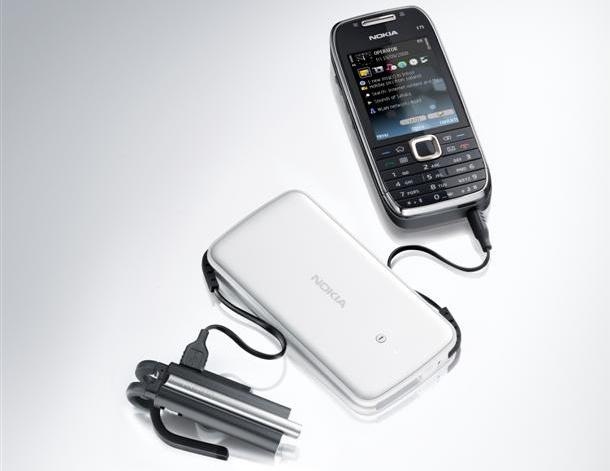 With just a charger and a few earplugs, we couldn’t help but feel like Nokia forgot a few extras. A pouch and desk stand should have been included.The Nokia BH-804 is ultimately the more stylish, well-rounded option, with a more impressive list of accessories. But what the 904 lacks in style and accessories it easily makes up for with its performance and extra features, delivering a truly impressive battery life and an equally impressive quick charge feature. With its 8 hours of battery life, smaller units can only dream of achieving half of that, coming to a halt at around the 4+ hour mark. 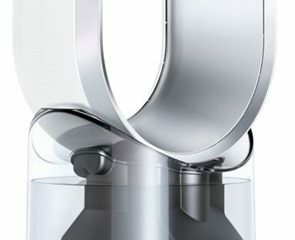 It does this using a speedy 35 minute charge, while a 15 minute “quick charge” should give at least 5 hours of juice. That’s an extra hour more than the maximum battery life on the BH-804! The 904 continues this stellar performance with loud and crisp audio and about twice the wireless range of smaller headsets. The sliding boom makes for an even larger looking unit that in terms of styling won’t appeal to everyone, but makes calls possible in scenarios we couldn’t think of using a Bluetooth headset. The use of a microUSB port is an important one and we loved the multi-point connection feature. 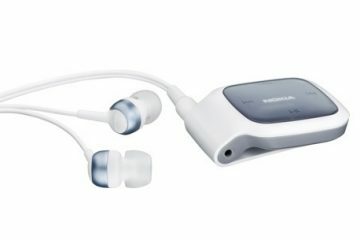 In the end, the Nokia BH-904’s large size is won’t appeal to everyone and isn’t as polished as the 804, but its impressive performance pulls manages to push it ahead of what we considered one of the best Bluetooth headsets out there and giving it a slightly better score of 9.5 out of 10.